Published: 10th March 2010M, We. Updated: 17th February 2013M / 18 Rabiulakhir 1434H, Mo. Pic 1 - My current Ubuntu desktop. 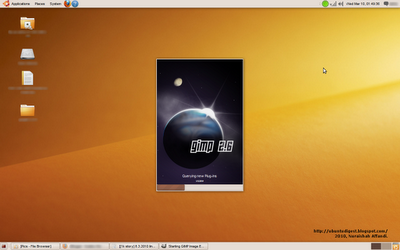 Waiting for GIMP (GNU Image Manipulation Program) to load. Monday, 8th March 2010: the turning point in my computing life. I'm crawling on a one-way highway from pirated Windows to Linux! Ubuntu to be precise. Files & folders from my robust 4-year old Toshiba Satellite M100 laptop are transferred to Abang's spacious PC via FileZilla. Sorry for encouraging piracy. As a Muslim, I want to avoid products deriving from stolen goods/services. A stolen item IS a stolen item; no matter how much good you get out of it. Furthermore, when asked in the hereafter, what am I to answer? The awareness matured overtime through many events. The decision itself to switch wasn't easy. I'm giving up the undeserving privilege of using various software and games for the sake of going clean. What I see coming is major learning and adaptation to the new OS. Hence, this humble blog to note and share what I've learned. My 1k stories are typed using MS Word. But this time is different. I'm writing straight into my blog, then editing it in OpenOffice.org Word Processor. 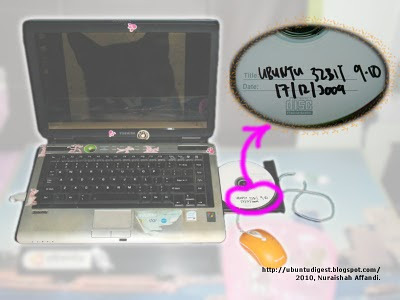 Pic 2 - The previous OS (operating system) before permanently switching to Ubuntu. Pic 3 - My robust Toshiba Satellite M100 laptop. Also showing the Ubuntu installation CD (compact disc), version 9.10. 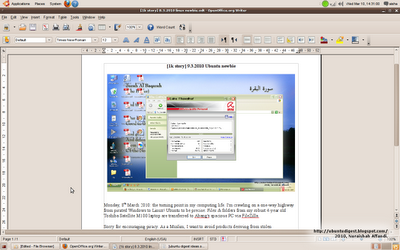 Pic 4 - Screenshot of OpenOffice.org Writer.